Visiting a new dentist can be intimidating. Our staff’s goal is to make you feel so welcome that as soon as you walk through the door, you feel like you are receiving a warm hug. In fact, we only consider you a new patient once, then you are part of our family. The serene environment at our office has been designed to pamper all of your senses. From the beverages while you wait, to the candles, original artwork that adorns the walls, ceiling-mounted televisions over each chair, and the warm or cool towels after the appointment; we want this to be a place where you can truly relax. When you arrive, Jennifer will greet you and offer you a cup of coffee or water from our fully stocked coffee bar. If you haven’t already filled out the forms online, she will answer any questions that you have after making you comfortable in the reception area. Then Lisa will meet with you in the consultation room. She will review your history and will find out more information about what has brought you in to see us and what you’d like us to do for you. Dr. Coleman will also come in to meet you. Lisa will then take you to the operatory where she will take radiographs and intraoral photographs if you need them. If you are here for dental implants, we will probably need a three-dimensional CT scan which we can also do in the office. Dr. Coleman will then come in for your examination. Plan on this examination lasting about an hour — he is very thorough. If you need a cleaning, that will take place immediately after the exam. We look forward to seeing you very soon! 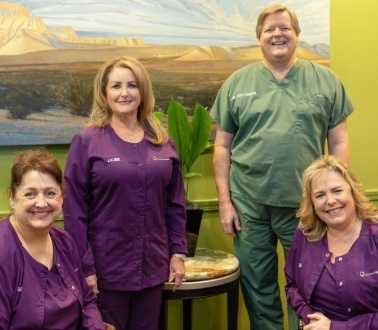 New patients, please give us a call at 713-783-2800 or fill out our request an appointment form online. It is our honor to take care of you.